Shares of JetBlue Airways and Southwest Airlines have plunged in recent weeks, but there's no reason for investors to be concerned. 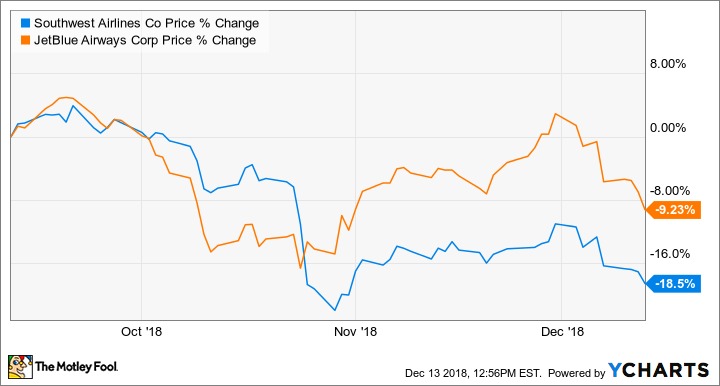 Over the past five years, JetBlue Airways (NASDAQ:JBLU) and Southwest Airlines (NYSE:LUV) have significantly improved their profitability while continuing to gain market share in the U.S. However, more recently, both low-fare airlines have faced some headwinds. Rising fuel prices put pressure on the bottom line at both companies this year -- but especially JetBlue. Moreover, stiffer competition from the legacy carriers has made unit revenue growth challenging. Through the first three quarters of 2018 as a whole, revenue per available seat mile (RASM) ticked up just 2% year over year at JetBlue and fell 0.7% at Southwest Airlines. Concern over these subpar unit revenue trends caused shares of JetBlue and Southwest to plunge in October. And while both stocks began to recover last month, they've moved sharply lower again in the past two weeks. Southwest Airlines and JetBlue Airways Stock Performance, data by YCharts. Recent unit revenue updates from JetBlue Airways and Southwest Airlines seemed to add to the downward pressure on their share prices. However, both carriers reported relatively stable RASM trends, which bodes well for long-term investors in light of recent fuel-price declines. Late last month, both Alaska Air and Spirit Airlines increased their unit revenue forecasts for the fourth quarter. This raised investors' hopes that the strong U.S. economy was continuing to drive robust growth in air travel demand. However, in early December, Delta Air Lines acknowledged that RASM growth would likely be in the lower part of its guidance range for Q4 -- albeit still up 3.5% year over year. Hawaiian Holdings subsequently cut its unit revenue guidance even more dramatically. Thus, the airline industry seems to be experiencing mixed revenue trends right now. Earlier this week, JetBlue and Southwest both indicated that unit revenue growth is coming in just as expected this quarter. Back in late October, Southwest Airlines projected that RASM would rise 1% to 2% in the fourth quarter. The company reaffirmed that forecast this week. Meanwhile, JetBlue's initial guidance called for 1% to 4% RASM growth for the quarter. On Wednesday, it narrowed that guidance to a range of 1.5% to 3.5% growth. JetBlue and Southwest Airlines expect to post low-single-digit RASM growth in Q4. Image source: JetBlue Airways. It's clear from the market's reaction to airlines' recent revenue updates that investors only will be satisfied with positive and accelerating unit revenue growth. This might have been a reasonable attitude in October, when the price of jet fuel was up by about $0.60 per gallon on a year-over-year basis. In that context, strong unit revenue growth was imperative just to keep earnings roughly stable. However, oil prices have plunged in the past two months. In fact, jet fuel currently costs slightly less than it did a year ago. As a result, in conjunction with its recent investor update, Southwest Airlines lowered its fuel-cost estimate for the fourth quarter by $0.05 per gallon, despite a $0.07 per-gallon decline in its projected hedging gains. JetBlue didn't formally update its fourth-quarter fuel-cost guidance, but its initial projection of $2.48 per gallon assumed an average Brent crude price of $81 per barrel. While Brent crude averaged $81 per barrel in October, the price fell to $65 per barrel last month and is closer to $60 per barrel today. Thus, even with no change in the unit revenue outlook, JetBlue Airways -- and to a lesser extent, Southwest Airlines -- will likely post higher-than-expected earnings this quarter. Looking ahead, airlines are currently on track to reap significant year-over-year fuel-cost savings in 2019 -- particularly carriers like JetBlue that don't hedge much. Even low-single-digit RASM growth should be enough to drive margin expansion and double-digit earnings growth next year. With both stocks trading for just 12 times projected 2018 earnings, investors appear to be underestimating JetBlue Airways and Southwest Airlines despite their strong track records.